As the name implies this club tailors to the sweet wine drinker in your life. But not all sweet wines are the same and this club is designed to showcase those differences. Members may travel to Italy and try a slightly effervescent Moscato d’Asti, to Germany to sample one of their many styles of Rieslings, or stay in America and try a Washington State spicy Gewurztraminer. Many styles and choices will be featured in our newest club so hop on board we are going for a sweet ride. 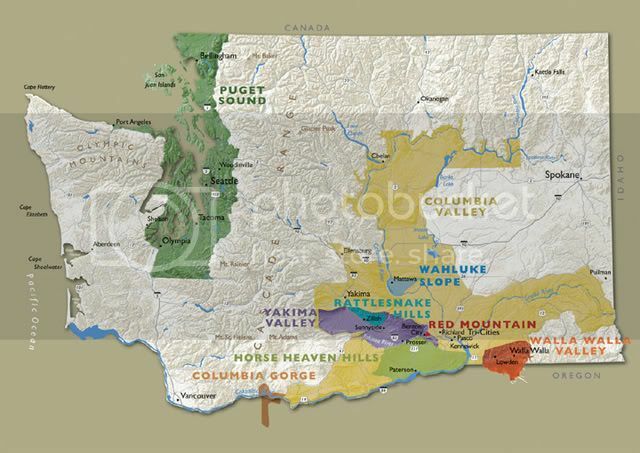 Located on approximately the same latitude (46ºN) as some of the great French wine regions of Bordeaux and Burgundy, Washington State wine “Touring” country includes 9 federally recognized American Viticultural Areas (AVA’s), commonly known as appellations; three of them share territory with Oregon State. Climates of individual Washington wine regions differ dramatically, being cross cut north to south by the Cascade Mountains. A variety of climates and soils combine with the long summer sunlight hours of northern latitudes to create prime growing regions, predominantly in the valleys and on the hillsides of areas east of the Cascade Mountain range. Washington wineries benefit from grapes ripening in these areas which experience about two more hours of summer sunlight each day than in California wine regions. Gradually cooling autumn temperatures in Washington also help wine grapes reach full maturity, while maintaining desirable acid levels. Vineyards on the east side of the Cascades grow 99% of Washington’s wine grapes. Seven of the state’s eight official AVA/appellations are located here — the macro appellation of the Columbia Valley encompasses the smaller Yakima Valley AVA, Red Mountain AVA, Walla Walla Valley AVA, Horse Heaven Hills, Wahluke Slope and Rattlesnake Hills (Washington State’s newest appellation). The Columbia Gorge AVA begins at the western edge of the Columbia Valley AVA and continues west and south to areas along the Columbia River in both Oregon and Washington. Two other emerging regions benefit from the huge rain shadow created by the Cascade Mountains, the North-Central Washington region (often referred to as the Columbia Cascade region) and the Lake Chelan area (AVA application in process). All totaled, Washington wine regions produce more wine grapes than any other state in the U.S., except California. Wine grapes are now the fourth most important fruit crop in Washington State behind apples, cherries and pears. The following wines are in limited distribution. Look for them when in Washington state. Barrel tasting allows tasters a sneak preview of upcoming vintages from their favorite wineries. This special weekend in the Yakima Valley features winemakers and cellar staff who are on hand to share insights and answer questions on the winemaking process. Many of the 50 participating wineries make special efforts to enhance the wine tasting experience by adding delicious cheeses, sauces, salsas, and even desserts to the mix along with special tastings and education. This is the only Wine Buying Tip you ever need to know!!! Every wine shop is different. Different focus, different selections, different pricing structures. Choose the one that works best for you. If you are new to the wine game and every bottle on the shelf is over $50 then you are probably in the wrong place. Look for stores that have either organized wine tastings or have wine available by the glass. What better way to know if you like a wine before buying than to taste it? Have in mind what the wine is for before you are bogged down by numerous regions, prices, etc. Are you looking for a simple wine to serve with dinner or planning a party for twenty? Knowing what you are looking for before you are in the store will help you to make better selections than just walking in and browsing until something strikes your fancy. There is a myriad of different sources of information on wine out there and bringing some with you to the store can only help in making an informed decision. Books, magazines, brochures and even, ahem, websites provide valuable information on producers and vintages that it is impossible to keep track of. The difference between a good vintage and a so-so vintage can be the difference in a wonderful wine and a so-so one. Resources such as The Wine Spectator and The Wine Advocate and even yours truly at winegeeks.com offer ratings of individual wines that can be extremely useful when selecting a wine, but remember: just because a wine isn’t rated or has a mediocre score doesn’t mean it is a bad wine. These are guidelines and someone else’s opinion. Don’t get caught in one section of the wine store. While some locales are very well organized, many are not, and the best bargain of the day may be just around the aisle. A quick trip around the shop to gain your bearings might be a good way to make sure that nothing is missed. Never be afraid to ask for help or a recommendation. Running into the pushy salesperson may be inevitable, but usually anyone working in the store will share your enthusiasm for the grape and asking what they like may get you a great bottle of wine. Also any salesperson worth their salt can get a feel for what you enjoy after a few trips to the store or even after answering just a few well-placed questions. Return trips and evaluations of what you tried last week can help the salesperson to judge your tastes. While a monstrous price tag may be well deserved for that bottle of 20-year-old Bordeaux, wines today are increasingly priced according to start-up costs for the winery or even the level of investment from outside sources instead of quality or reputation. In fact, wines from the traditional wine growing regions are sure to be higher in price than something from a less known vineyard area regardless of how good the wine is. Use your resources! Many wine regions are known for their ability to produce very nice wines at still reasonable prices. Spain, Australia, Argentina and Chile are just a few countries to try. Another option is to try wine from areas just outside of more well known wine growing regions. Instead of the pricey Pomerol in Bordeaux, try Lalande-de-Pomerol. Same grape (Merlot) from just down the road at a much lower price. Also, look for the 2nd labels of more established wineries. These are wines sold under a different label from a quality winery sold at a lower price, a practice quite common in Bordeaux and gaining steam in California. Trying something new can be a great way to learn about new wines and new countries. Try a recommendation from someone at the shop, sample a new region, or even go with the advice of the shelf talking card pinned next to a wine. It may be the best wine that you have ever had! Most shops offer a 10% discount on wine sold by the case, mixed or not. Look for any close-out specials or wines on sale. Because it is half-off doesn’t mean it is terrible. Wines are often sold at what the state dictates, and it may be more than what the market will bear. These may be marked down significantly before the next vintage arrives, and can offer significant savings to the consumer. There are numerous sites that offer online sales of wine. These sites can offer wines at considerably less than your local store or have hard to find rarities. Be forewarned: Many states do not allow point-to-point sales of wine or alcohol. Most sites will list which states they can ship to. This is a contentious issue soon to be decided by the U.S. Supreme Court, but until then make sure you read the fine print. Well, there you have it. This is by no means all you need to know when buying wine but it will certainly help you along your way. Use these ten points and the trepidation of wine buying should fade to the bottom of your stomach like the tannins of an old port. It should be loved and looked forward to like shopping for any thing of beauty, like going to the car parts store for your ‘67 Chevy or to the jewelry store on Valentine’s Day. The best part is how much do they have at the jewelry store for less than ten dollars? California wine has a long and continuing history, and in the late twentieth century became recognized as producing some of the world’s finest wine. While wine is made in all fifty U.S. states, it is California where the great majority (up to 90% by some estimates) is produced. California would be the fourth largest producer of wine in the world if it were an independent nation. In 1769, Franciscan missionary Father Junípero Serra planted the first California vineyard at Mission San Diego de Alcalá. Father Serra continued to establish eight more missions and vineyards until his death in 1784 and has been called the “Father of California Wine”. The variety he planted, presumably descended from earlier Mexican plantings, became known as the Mission grape and dominated California wine production until about 1880. California’s first documented imported European wine vines were planted in Los Angeles in 1833 by Jean-Louis Vignes. In the 1850s and 1860s, Agoston Haraszthy, a Hungarian soldier, merchant and promoter, made several trips to import cuttings from 165 of the greatest European vineyards to California. Some of this endeavor was at his personal expense and some through grants from the state. Considered the one of the founders of the California wine industry, Haraszthy contributed his enthusiasm and optimism for the future of wine, along with considerable personal effort and risk. He founded Buena Vista Winery and promoted vine planting over much of Northern California. He dug extensive caves for cellaring, promoted hillside planting, fostered the idea of non-irrigated vineyards and suggested Redwood for casks when oak supplies ran low. In 1861 Charles Krug established Napa Valley’s first commercial winery in St. Helena. In 1863, species of native American grapes were taken to Botanical Gardens in England. These cuttings carried a species of root louse called phylloxera which attacks and feeds on the vine roots and leaves. Phylloxera is indigenous to North America and native vine varieties had developed resistance. European vines had no such evolutionary protection. By 1865, phylloxera had spread to vines in Provence. Over the next 20 years, it inhabited and decimated nearly all the vineyards of Europe. Many methods were attempted to eradicate phylloxera but all proved temporary and none economical. Finally Thomas Munson, a horticulturist in Texas, suggested grafting the European vinifera vines onto American riparia rootsocks. So, there began a long, laborious process of grafting every wine vine in Europe over to American rootstocks. It was only in this manner that the European wine industry could be retrieved from extinction. In 1879 Captain Gustave Niebaum established Inglenook Winery in Rutherford, California a small village (in Napa County, California). It was the first Bordeaux style winery in the USA. Captain Niebaum’s wines became world renowned. His Inglenook wines won gold medals at the World’s Fair of Paris in 1889. During the period when the Europeans were contending with phylloxera, the American wine industry was ironically flourishing. By 1900, America had a fully developed and proud commercial wine producing business. Many California wines received medals in European competitions. Barrels of California wine were being regularly exported to Australia, Canada, Central America, England, Germany, Mexico and the Orient. Through a loophole allowing each home to “make 200 gallons of non-intoxicating cider and fruit juice per year,” thousands of otherwise law-abiding citizens became home winemakers and bootleggers. Prices for fresh grapes shot up, because of the increased demand and a railroad shortage of refrigerated freight cars in which to ship them. Growers began replanting fine wine variety vineyards to juice grape varieties that shipped well. The massive plantings produced a constant surplus of low-quality grapes that persisted until 1971. By the time of National Repeal, effective December 5, 1933, the industry was in ruins. Although some wineries managed to survive by obtaining permits to make wines used for medicinal, sacramental and non-beverage additive purposes, production dropped 94% from 1919 to 1925. Even after Repeal of Prohibition, several states stayed dry: Kansas until 1948, Oklahoma until 1957, and Mississippi until 1966. Seventeen states chose to establish monopoly liquor stores with limited selections. Today 10% of the US area and 6% of the population remain dry. Anticipating Repeal, speculators and others soon flooded the legal market with quickly and poorly made wine. Dilettantes published books and articles warning Americans about rigid rules that must be followed to serve the proper wine with the proper food from the proper glass at the proper temperature. Faced with low quality products with which to risk committing social blunders and while remaining uncertain about the social acceptance of any alcohol, most Americans stayed away. The only group of wines that sold well were the fortified dessert wines. Taxed at the lower rate of wine as opposed to distilled spirits, but with 20% alcohol, this group made the cheapest intoxicant available. Before 1920, table wines accounted for 3 of every 4 gallons shipped. After 1933, fortified wines were 3 of every 4 gallons shipped. It wasn’t until 1968 that table wines sales finally overtook fortified wines, regaining the status of most popular wine category. Before 1920, there were more than 2,500 commercial wineries in the United States. Less than 100 survived as winemaking operations to 1933. By 1960, that number had grown to only 271. California had 713 bonded wineries before Prohibition; it took more than half a century, until 1986, before that many were again operating. Prohibition left a legacy of distorting the role of alcohol in American life and ruining a fledgling world-class wine industry, which took decades of work to overcome. Research at the University of California at Davis and Fresno State University greatly assisted the new breed of vintners who arrived in California in the 1960s and who were committed to producing wine of the highest international standards. André Tchelistcheff is generally credited with ushering in the modern era of winemaking in California. Beaulieu Vineyards (BV) founder and owner Georges de Latour hired Tchelisticheff in 1938. He introduced several new techniques and procedures, such as aging wine in small French Oak barrels, cold fermentation, vineyard frost prevention, and malolactic fermentation. Brother Timothy; a member of Congregation of Christian Brothers was also very instrumental in the creation of the modern wine industry. After an earlier career as a teacher, he transferred to the order’s Mont La Salle located on Mount Veeder in the Mayacamas Mountains west of Napa in 1935 to become the wine chemist for the order’s expanding wine operations. The Christian Brothers had grown grapes and made sacramental wine in Benicia, California during Prohibition, but decided to branch out into commercial production of wine and brandy following the repeal of Prohibition. The science teacher was a fast learner and soon established Christian Brothers as one of the leading brands in the state’s budding wine industry; Brother Timothy’s smiling face in advertisements and promotional materials became one of the most familiar images for wine consumers across the country. In 1965, Napa Valley icon Robert Mondavi broke away from his family’s Charles Krug estate to found his own in Oakville, California. It was the first new large-scale winery to be established in the valley since before prohibition. Following the establishment of the Mondavi estate, the number of wineries in the valley continued to grow, as did the region’s reputation. Some California wine makers began to produce quality wines but still had difficulty marketing them. Frank Schoonmaker, a prominent journalist and wine writer of the 1950s and 1960s introduced the idea of labeling wines using varietal (Pinot Noir, Chardonnay, Riesling) rather than generic names borrowed from famous European regions (Burgundy, Chablis, Rhine, etc.). Robert Mondavi was one of the first to label the majority of his wines by varietal names and was tireless in promoting the practice. By the late 1960s and early 1970s, the quality of some vintners’ wines was outstanding but few took notice. On May 24, 1976, a blind tasting was held in Paris with a panel made up exclusively of French wine experts. After comparing six California Chardonnays with four French Chardonnays, three of the top four were Californian. All nine judges ranked Chateau Montelena the highest; Chalone Vineyard came in third and Spring Mountain Vineyard fourth. When reds were evaluated, Stag’s Leap Wine Cellars was ranked number one. This competition focused a great deal of attention on wines from the Napa Valley. The red wines evaluated in 1976 were retasted in two separate blind tastings (the French Culinary Institute Wine Tasting of 1986 and the Wine Spectator Wine Tasting of 1986) and also in the The Wine Rematch of the Century. In all retastings, a California red was chosen first, while the French wines lost positions in the rankings. Fred Franzia and his Bronco Wine Company has caused recent waves in the business of California wine marketing. The company’s low priced Charles Shaw wine which is sold exclusively by Trader Joe’s markets along with the company’s other labels have attracted new entry level wine consumers to the fold but also has alienated many of the smaller vintners in the state by placing some downward pressure on pricing. Backed by continuing research, California vintners continue to innovate in attempts to further enhance the quality and competitiveness of their products. The story of California wine continues to evolve.